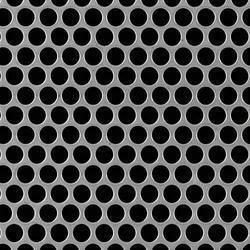 Pioneers in the industry, we offer s.s.perforated sheet, perforated sheet, m.s perforation sheet, mild steel perforated sheet, stainless steel perforated sheets and stainless steel perforated design sheets from India. 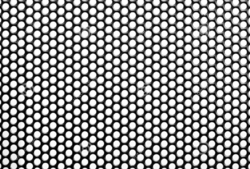 We are a reputed name in the industry for manufacturing and supplying S.S. Perforated Sheet, which finds extensive usage as screen, guard, filter and shield for controlling passage of air, water, solids and electromagnetic waves. The product is regarded for being made from high quality stainless steel and accurate in dimensions. It is resistant to alkalis, acids and corrosion. We are manufacturers and suppliers of Perforated Sheet of different sizes and different thickness. We are doing perforation in all gauges available between thickness 0.2 mm to 5 mm and the size of perforations can be adjusted according to the clients’ needs. These sheets are available with holes of different shapes like long holes (Capsule Shape 10 mm x 20 mm hole), Round holes (0.3 mm - 75 mm), oblong holes, rectangular shaped, square shaped ( 6 mm , 8 mm , 10 mm , 12 mm) star-shaped, dashed holes, and many other shapes as illustrated by the client. Our Perforated sheets are mainly used in fabrication works, machinery parts, filtration parts, agricultural industries, food industries, decoration and many other purposes. Choice of hole sizes like long holes (Capsule Shape 10mmx20mm hole), Round holes (0.3mm - 75 mm), oblong holes, rectangular shaped, square shaped ( 6 mm , 8 mm, 10 mm, 12 mm) star-shaped, dashed holes, and many other shapes. We have set a benchmark in the industry for manufacturing and supplying M.S. 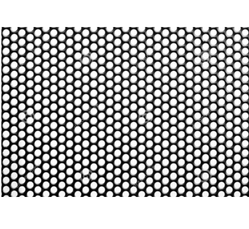 Perforation Sheet. The product is impeccable in tensile strength and made from high quality stainless steel procured from a reliable vendor base. It is widely used in for making room sound proof and ventilation of warehouses. We are specialized for handling bulk orders, owing to our sophisticated manufacturing unit and dexterous professionals. 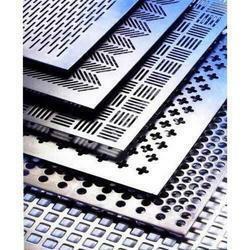 We are offering wide range of Mild Steel Perforated Sheets. These are manufactured by the quality raw material and available at reasonable prices. Customers can avail these sheets from us in aluminum, galvanized iron, stainless steel, mild steel and other alloys as per their need. For Air Filters : Used in Automobiles i.e., buses, trucks, car, motorcycle etc. For Industrial Filters : Generators and Compressors. Owing to our expertise in this domain, we have been able to cater to the variegated requirements of the customers by bringing forth Stainless Steel Perforated Sheets. Owing to our expertise in this domain, we have been able to cater to the variegated requirements of the customers by bringing forth Stainless Steel Perforated Design Sheets. Owing to our expertise in this domain, we have been able to cater to the variegated requirements of the customers by bringing forth Perforated SS Sheets.